CLIMATE: Cool winter with snow, mild summer. BEST TIME TO VISIT: Anytime. COMMENTS: Population is 3. Lamont was named after homesteader James "Jimmie" Lamont. Lamont had a small store in his home and is credited with installing one of the first windmills in the area. With the discovery and drilling of oil in the area, the need for a post office was filled by establishing it in Lamont's store. 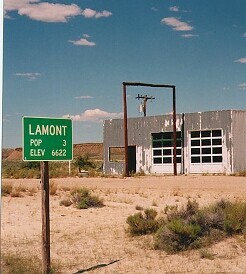 The post office was named Lamont. Submitted by Dana B. Hannon. Enjoy your site. I lived in Lamont, Wyoming from 1963 through 1969. My father worked for an oil company. At that time you could not live in Bairoil, five miles away, unless you were an employee of Chevron. I went to a one room school about a half mile from Lamont up on the hill by the highway. It is still there. It was for 1st through 3rd grade. After that we were bused down to Bairoil. There were at one time only five students in grades 1st through 3rd. The Logan family were the caretakers of the school and lived in an apartment on the top floor. We would go up there for lunch. The gas station in your photo was close to the school. When I was there it was operated by a man named Richard Schanks who lived in a trailer house on the property. In Lamont at that time there was the café, a store and gas station, which had a post office, a telephone booth outside, a building with a restroom and laundry facilities, and a series of cabins which travelers and visiting workers could rent and stay in, like a motel. 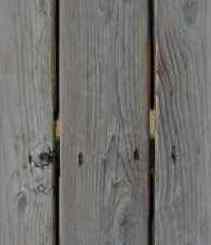 When someone would get a phone call the person working at the store would send someone to knock on their trailer and you would go talk on the phone outside in the phone booth. We lived in a trailer house along with the other residents. The population of the town would fluctuate based on the boom or bust of the oil work in the area. Lamont at that time was owned by a man named Algot Hall. He lived in the house to the west of the café which is still there (I drove through two years ago). The year after we moved from Lamont, Mr. Hall was killed on the highway when he was hit by a semi during a snowstorm. His wife and children moved to Rawlins. I believe his brother, Cecil, was a prominent lawyer in Rawlins. Another great ghost town close to Lamont was about five miles south east. It was a former Chevron pumping station but had been abandoned and the sand dunes almost covered it over. It was quite eerie to ride our Honda 90 back there and explore. I remember old Model T cars and visible gas pumps just rusting away. I believe the name was Pumping Station 23, or something similar. I suggest you research this. When I went through two years ago there is only the café, the Hall’s house and a few other buildings remaining. The gas station, store, post office, cabins, all gone. My brother and I did go down to Bairoil and looked around the school as we went there for a couple of years after 3rd grade. Back when I lived there on the corner of the highway and the road to Bairoil were a collection of abandoned houses and a bar, the Pronghorn. There was one house that was occupied in this little collection of buildings. It was actually a nice white house and a family with the last name Van Vleet lived there. In between the corner I described and Bairoil was another small Chevron Camp. It was referred to as the Wertz Camp and I was friends with two boys who lived there that had the last name DeSomber. Growing up in Lamont was very different. My brother and I had a motorcycle, guns, dogs, and even drove cars around on the dirt roads. We played basketball at Bairoil and everyone was required to take band. The school district was very wealthy as they received money from the oil production. I remember going on school basketball trips to play Eden Farson, the Rawlins schools, a school called Poison Spider, Jeffrey City, Medicine Bow, and other schools. We also went on overnight band trips and there was always a big spring break day at Sinclair where we went and had a cookout. I do remember that years later one of our classmates from Bairoil was selected as Miss Wyoming. Anyway, thanks for letting me share my memories.